After a bad night and an early morning call to Jimmy’s Leeds, I was looking forward to catching up with my sleep on the journey to Reading. Again thank you to fans who spoke to me in support of my husband and me as they are greatly appreciated. I’d seen Andy Loftus post that the plaque for Chris and Kev have been cleaned and restored by Richard Illingworth. As the anniversary of their murders in Turkey nears, I want to say well done as he has done a brilliant job. I was glad I wasn’t driving with the rain and wind causing problems, but things had calmed down by the time we got to the ground just before kick-off. Reports from those who attended the U23s game at Elland Road on Monday gave some fantastic feedback. They were playing the same way as the first team and there are some more great prospects coming through with the youngsters which are good to hear. Seeing it all falling into place behind the scenes is certainly good news for our club and long may it continue. The other good news was hearing Jack Clarke had returned to the U23s after his recent illness so that is a relief knowing he is okay. The team: Casilla, Jansson, Cooper, Ayling, Alioski, Roberts, Bamford, Harrison, Hernandez, Phillips and Klich. Subs: Dallas for Ayling (57), Shackleton for Roberts (69) and Douglas for Klich (74). Leeds won the game 3-0 with Klich (14) and Hernandez scoring two (22 and 43). Attendance was 17,701 with 2,071 Leeds fans. We started off with a lot of possession but seemed nervy with misplaced passes which Reading took advantage of but Casilla made the save to keep them out. Once our nerves settled though, we took the game by the scruff of the neck. Ayling ran down the right, passed the ball into the middle for Klich to score after Bamford had dummied the ball to put us into an early lead. Klich is scoring goals rang out from the Leeds fans who were in good voice. We’d sold out again although we were only given just over 2,000 tickets due to Reading having a “singing area” in the same stand as us. I’d commented that I hoped we could score plenty of goals to shut that drum up! We took the game to Reading then and took a further lead when Ayling once again passed the ball in and Hernandez hit his shot off the foot of the post that went into the goal. The Leeds fans celebrated in style as that would hopefully take the pressure off us. We hadn’t stopped there as we continued on the attack coming close from Klich before Bamford brought a save out of their goalie. Just before half time we scored a third when Hernandez scored a fantastic strike after Bamford released the ball to him. We had taken to scoring from distance today instead of walking the ball into the net which had taken Reading by surprise! 3-0 at half time saw some really happy Leeds fans going into the break. Again at half time we saw lads who couldn’t be bothered to find their own loos using the Ladies! Although we did manage to shoo some lads out of there and told them to find their own! The Leeds fans below the stand were having a great sing song although two decided to climb up onto the overhead pipes which had my heart in my mouth. I can’t understand those who throw their beer around though especially when it costs so much plus I had to walk gingerly to make sure I didn’t fall on the wet floor! The second half saw Leeds take their feet off the pedal as we started playing further back. Unfortunately that saw the nerves kick in a bit for me as that’s what normally catches us out. We did still attack, but this format saw Reading get into the game more. When Ayling tried getting out of the way of a Reading player their fans were screaming at him to be sent off. There was no way he could get out of the way and the ref spoke to him. As he’d already been booked Leeds did the right thing and subbed him as he was in danger of being sent to the dressing room. He’d played well though. As the game continued my nerves eased a bit as I saw Leeds were coping well with everything thrown at them. We came so close to a fourth goal when Bamford should have done better and then Hernandez saw his shot go inches wide. Bamford came close again which saw the Reading fans start to give him some stick so the Leeds fans upped their support of him! Hernandez was very unlucky not to get his hat trick though when the goalie made a save initially and he was unable to get to the rebound. Leeds managed to keep another clean sheet as we took the three points to go back to the top of the league and sent a great Leeds support home happy. As Reading hasn’t been a happy hunting ground for us it was great to get the win too. For once we didn’t have to negotiate closed motorways on the way home and had a relatively good journey home although the wind closer to Yorkshire and on the M62 was still causing issues. 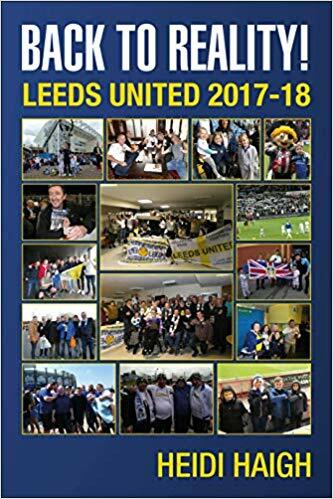 Saturday sees a crunch game with Sheffield United coming to Elland Road for the early kick off. With another sell-out home crowd both teams have a good run behind them. We know what we have to do Leeds, three points please. See you there, LUFC – Marching on Together.